On a particular long Trans-Pacific flight 6 months ago; I came across an article about a technique which photographers use spotlight to give models the appearance of glowing pink skin tone. Well, even if I am able to get hold of such a spotlight, I can’t walk around with it spotting me all day. 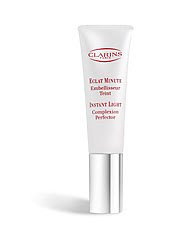 So when I heard on a beauty talk show about a Clarins product that may help a gal achieve light pink glow, I ran out and bought a tube. This light peach-pink base smoothes out skin tone adding a subtle transparent pink glow to the face. I have blended this product with foundation or alone with moisturizer for about 6 months. It made life so much easier for me in the morning to achieve that light pink glow. Granted it helps to eat well, and exercise regularly to achieve glow from within but anything helps!